Kevin Dufour, Pierre-Luc Mercier and Matt Pohlkamp enjoy keeping their games simple. 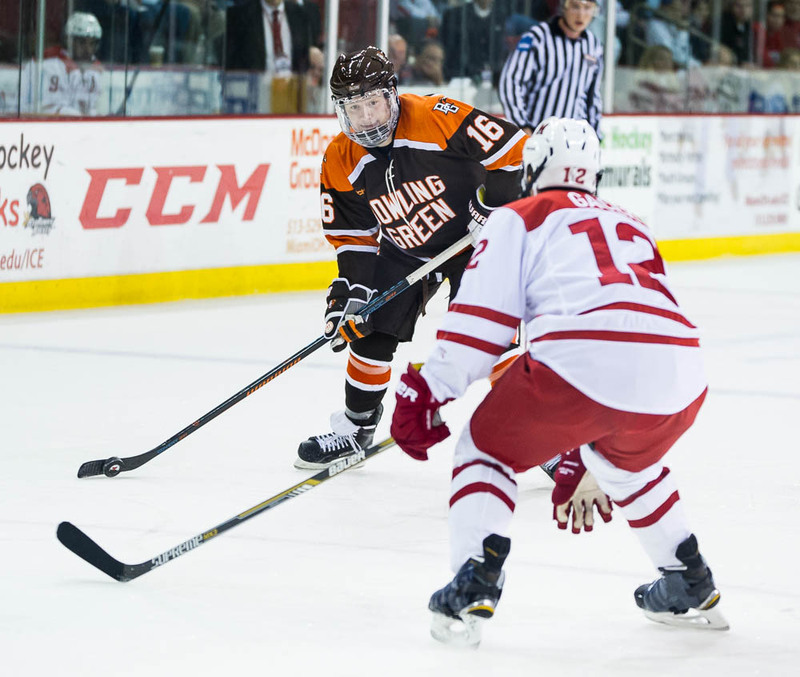 The Bowling Green sophomores have been effective with good forechecking during the team’s first four games this season. The linemates have combined for seven goals and seven assists, entering this weekend’s nonleague series at Clarkson. The Falcons, 3-1 overall, and Clarkson (2-2) play Friday night at 7 and Saturday night at 7:30. Dufour is 6-foot, 195 pounds, Mercier is 6-0, 184 and Pohlkamp is 6-0, 200. Mercier centers the line, flanked by Dufour on the left and Pohlkamp on the right. The three are at their best when they’re controlling the puck in the offensive zone, and they have the ability to score. All three skate on the power play, and Pohlkamp and Mercier members of the penalty-killing unit. The sophomores are roommates, along with classmate and goalie Tomas Sholl. “We just try to be opportunistic around the net,” Dufour said. SPECIAL TEAMS: The Falcons lead the WCHA in special teams net, a statistic that includes all power-play and short-handed goals, for and against. BG is a plus-7 on special teams through four games. The Falcon power play ranks second in the league and eighth nationally at 30.4 percent. 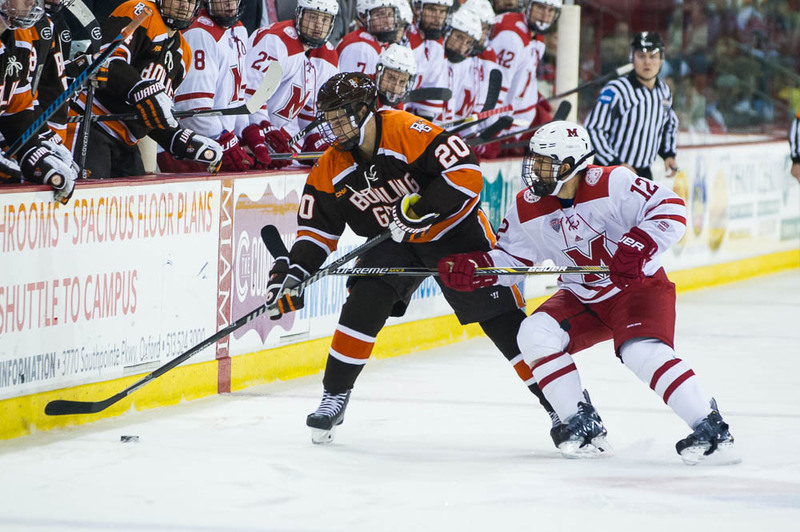 The BG penalty-killing is tied for third in the league and eighth nationally at 93.3 percent. The BG power play is 7 of 23 this season after going 4 of 12 at UAH. The Falcons haven’t allowed a power-play goal in three of their four games and were 9 of 9 killing penalties against UAH. “We’re confident in our special teams, and we know they can help us win games,” Dufour said. Clarkson’s power play has scored just once in 15 attempts, but it has allowed just one power-play goal in 13 attempts. OFFENSE: The Falcons have had a balanced offense. Eight players have scored at least goal this season, including Dufour, who leads the country with six. BG is averaging 3.5 goals per game, good for a four-way tie for fourth in the league. “ It’s proof of our depth and we need to rely on our depth to score, but that’s not a surprise to us,” Bergeron said of the balance. Fourteen Falcons have at least one point. Dufour and Nolan Valleau both have six points, while Brandon Hawkins has five, and Pohlkamp and Mercier both have four. The Falcons’ success on defense has come even though Adam Berkle, Dan DeSalvo and Mark Cooper have just one assist each. Freshmen forwards Hawkins, Mitch McLain and Jacob Reichert have combined for four goals and five assists. And defensemen Valleau and Mark Friedman have combined for a goal and eight assists. CLARKSON: The Golden Knights are 2-2 after losing 2-1 and 3-0 to 17th-ranked Vermont last weekend in a home-and-home series. Clarkson opened the season with 3-1 wins over Niagara and RIT Oct. 10-11. Sophomore Steve Perry started all four games in goal, posting a 1.75 goals-against and a .910 save percentage. Seven different players have scored Clarkson’s seven goals, including senior forward Joe Zarbo, who has three assists. Clarkson, which has its homecoming this weekend, was picked to finish eighth in the 12-team Eastern College Athletic Conference coaches poll.